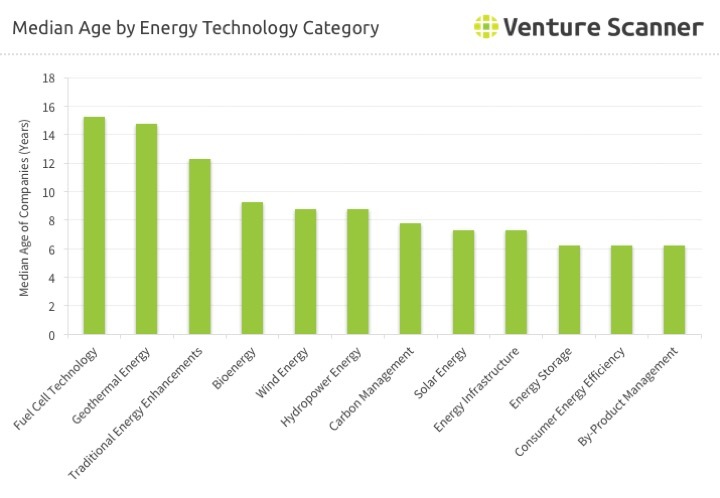 The analyses below summarizes the maturity of Energy Technology startups by category. 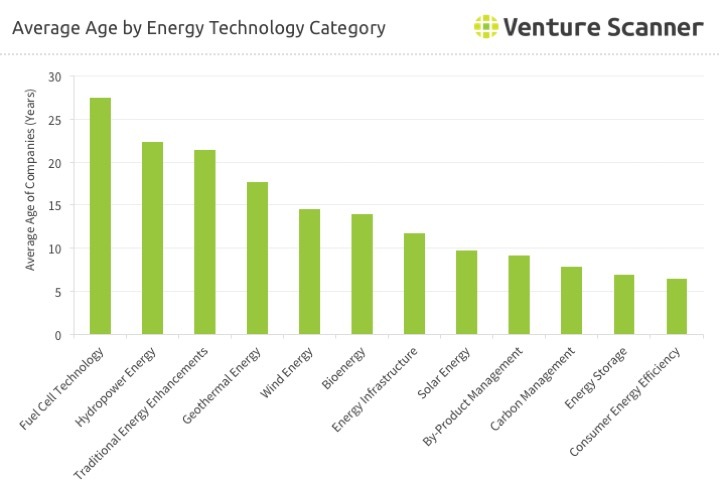 The above graph summarizes the average age of companies in each Energy Technology category. Fuel Cell Technology ranks as the most mature Energy Technology category with an average age of 27 years per company, followed by the Hydropower Energy category with an average age of 22 years per company. We included a few established companies that are still innovating in these categories, which explains their relative maturity. 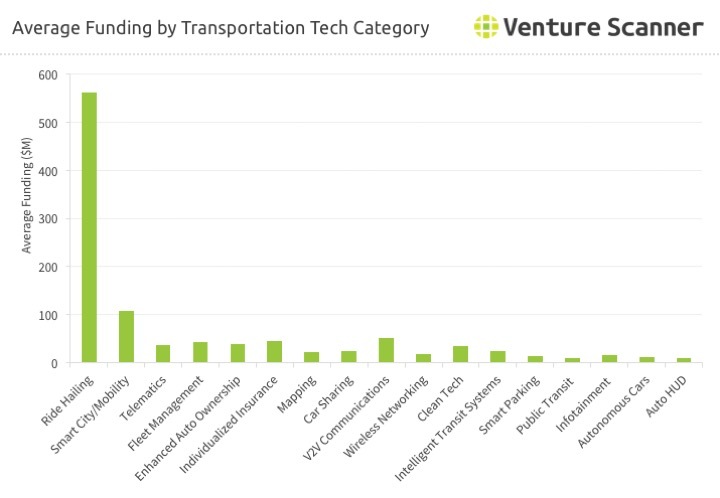 The above graph summarizes the average company funding in each Transportation Technology category. The Ride Hailing category leads the market with over $559M in funding per company, followed by the Smart City/Mobility category with over $107M in funding per company. In the Ride Hailing category a few key TransportationTech players such as Uber, Didi Chuxing, Lyft, and Ola all raised major rounds of funding upwards of $1B. We are currently tracking 853 Transportation Technology companies in 17 categories across 58 countries, with a total of $43 Billion in funding. Click here to see the full Transportation Tehnology landscape report and data. 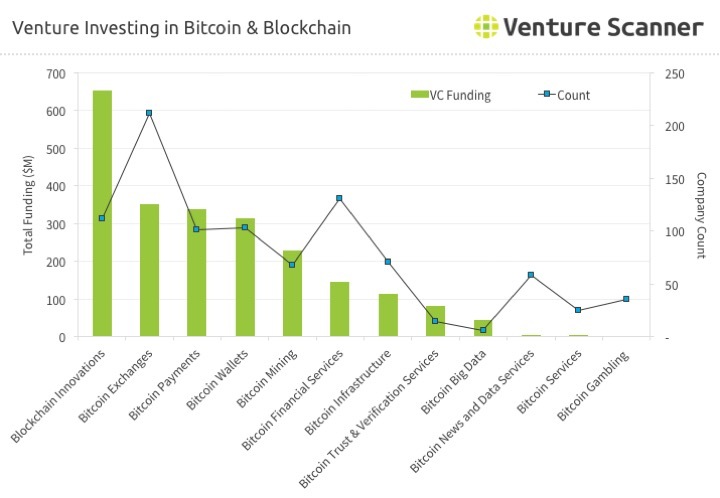 The above graph compares the total venture funding in each Bitcoin category to the number of companies in the category. The Blockchain Innovations category is leading in the Total Funding stat with over $500M, whereas the Bitcoin Exchanges category is leading in the Company Count stat with 210 companies. We are currently tracking 815 Bitcoin Technology companies in 12 categories across 71 countries, with a total of $1.5 Billion in funding. To see the full Bitcoin Technology startup report, contact us! 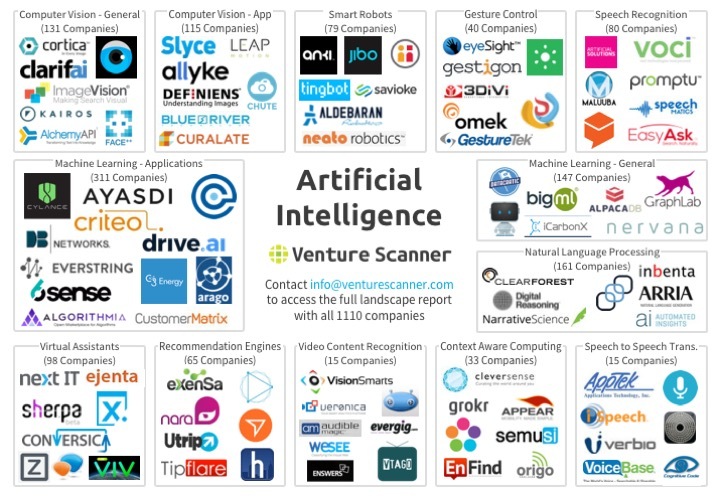 The above sector map organizes the Artificial Intelligence sector into the 13 categories listed below and shows a sampling of companies in each category. 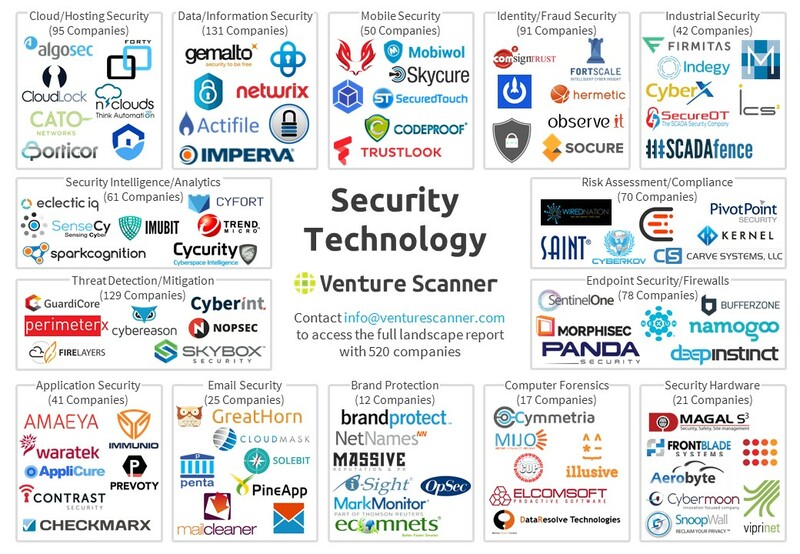 We at Venture Scanner are tracking 520 Security Technology companies across 14 categories, with a combined funding amount of $6 Billion. The 15 visuals below summarize the current state of Security Technology. Cloud and Hosting Server Security: Companies that provide security solutions that protect hosting servers from being attacked. Examples include security solutions for cloud applications, third-party cloud services, and cloud data files. Identity and Fraud Security: Companies that authenticate identities, approve access within a system, and monitor activities to prevent fraud. Examples include password management, security tokens, and digital identity management. 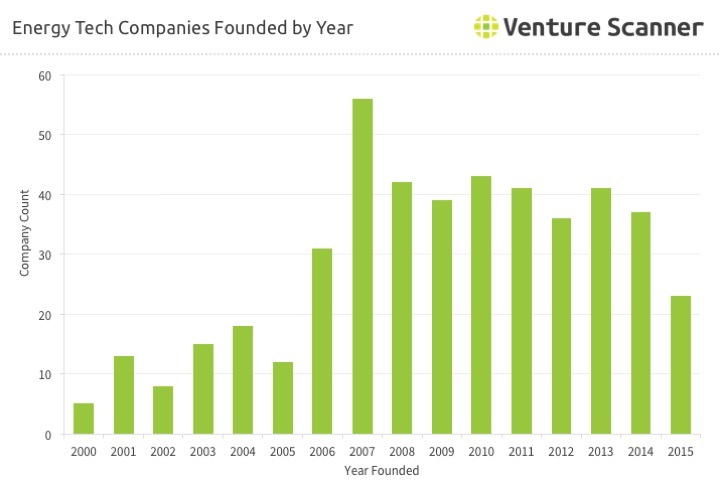 The above graph summarizes the number of Energy Technology startups founded in a certain year. The year 2007 ranks as the top year with 56 Energy Technology companies founded. 2010 is in second place with 43 Energy Technology companies founded. We are currently tracking 674 Energy Technology companies in 12 categories across 43 countries, with a total of $32 Billion in funding. To see the full Energy Technology startup report, contact us! 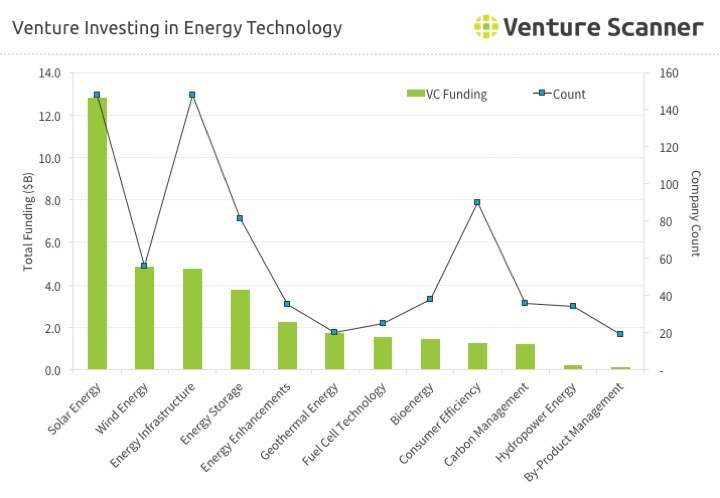 The above graph compares the total venture funding in each Energy Technology category to the number of companies in the category. The Solar Energy category is leading the Total Funding stat by a wide margin with over $12.8B in the category. Solar Energy also leads in the Total Companies stat (along with Energy Infrastructure) with 148 companies. Energy Infrastructure, however, has 1/3 the funding of the Solar Energy category. The Solar Energy companies with the most funding include SolarCity, Sunnova, and Sunrun, each having raised over $900M. 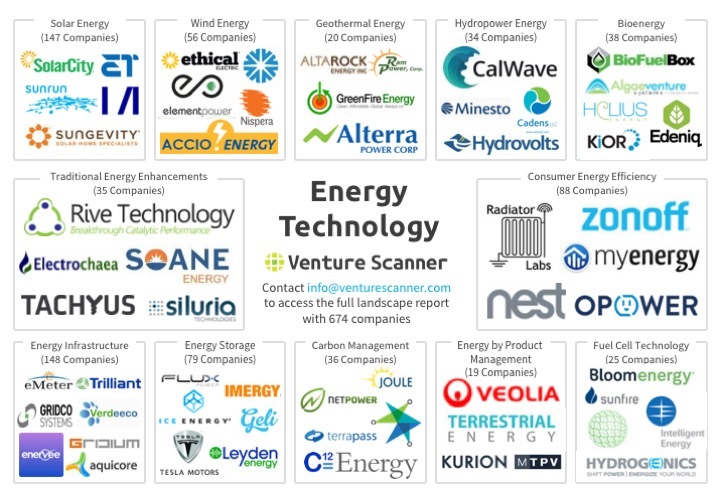 We at Venture Scanner are tracking 687 Energy Technology companies across 12 categories, with a combined funding amount of $32.3 Billion. The 15 visuals below summarize the current state of Energy Technology. Solar Energy: Companies that generate power by converting sunlight into electricity. Examples include solar panel manufacturers, designers, installers, and monitoring solutions. Wind Energy: Companies that generate power using air flow. Examples includes wind turbine manufacturers, designers, installers, and monitoring solutions. Geothermal Energy: Companies that use heat from the earth to generate power. Examples include geothermal energy development, design, and monitoring. 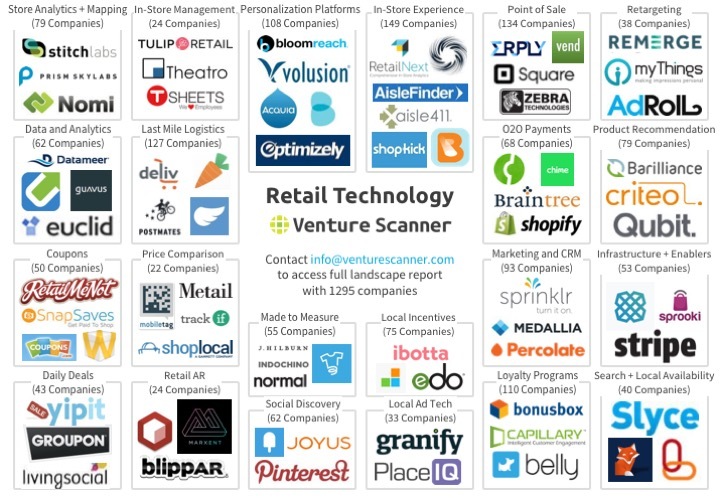 We at Venture Scanner are tracking 1295 Retail Technology companies across 22 categories, with a combined funding amount of $27.5 Billion. The 15 visuals below summarize the current state of Retail Technology. Automated Personalization Platforms: Companies that work with retailers to optimize sales for different users. Examples include delivering custom ads, allowing for A/B testing, and platforms that tailor websites to each individual user's specific tastes. Coupons: Companies that focus on providing both traditional and digital merchant coupons. Examples include companies that create merchant-specific coupons as well as coupon aggregating websites. We are excited to introduce our coverage of the Security Technology startup landscape which stands at 520 companies across 14 categories and $6.2 Billion in funding. To see the full Security Technology landscape report and data, visit us at https://www.venturescanner.com/security-technology or contact us at [email protected].